The RTBG is Australia’s second oldest botanic garden, established on the Domain site in 1818. The RTBG’s history mirrors the history of Australia’s other colonial era botanic gardens, with periods as a repository for plants needed for food or likely to be of economic benefit in the development of the colony and with the early importation of many thousands of fruit trees and vines. A subsequent phase reflected the colonist’s state of mind, with the importation and cultivation of many forest trees and plants traditionally grown in the home country juxtaposed with collections of, and a growing interest in, the Tasmanian flora. During this period the RTBG provided plants for gardens and parks in many other areas of Tasmania, contributing significantly to Tasmania’s cultural heritage landscapes. 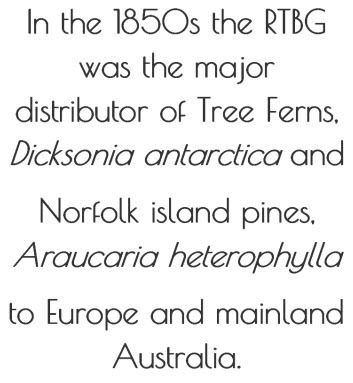 The RTBG also reflects the Twentieth Century focus of many botanic gardens on collections showing world flora and extolling botanical curiosity and diversity. This has been tempered in the case of the RTBG by a concentration on cool temperate flora (including the many conifers that form the backbone of the Gardens collections) and the introduction of flora from the southern hemisphere, including an early collection of plants from New Zealand.